Are you recovering from a serious neck injury or have you been dealing with ongoing neck pain that’s caused by using the wrong type of pillow? Using the right type of pillow is very important in order to keep the spine and neck in the correct position as you sleep. Using a pillow that doesn’t offer the right type of support can hinder your recovery, or cause neck pain all on its own. The best pillow for neck pain is the Mediflow Orginal water base pillow, which offers plenty of support and allows you to adjust the pillow to the perfect level of firmness, allowing you to feel great in the morning and sleep soundly at night. 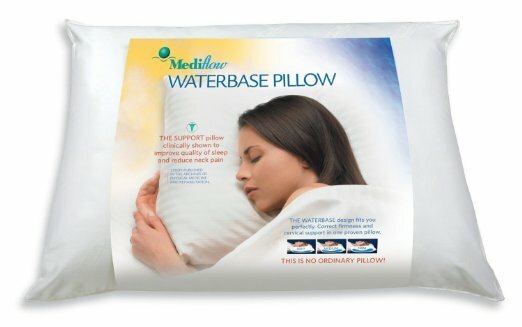 This waterbase pillow underwent a clinical study that earned it top marks. The innovative design features a thin water pouch located on the bottom of the pillow and a five-inch layer if hypoallergenic polyester fiber. The water pouch can be filled with water based on user preference. The average polyester pillow feels soft and plush during the first few days of use, but they typically flatten out pretty quickly. A memory foam pillow can provide the right amount of support to the neck but can be too hard on the head and face to rest comfortably throughout the night. This waterbase pillow provides the perfect level of support in order to achieve a restful sleep, due to the customizable water cushion, which promotes uninterrupted sleep. This pillow will automatically adjust as you move around in your sleep. This pillow automatically responds to head movement during sleep in order to maintain proper support. The head will rest on a plump, soft layer of polyester fiber, which is supported by the thin waterbase. The level of firmness can be adjusted by removing or adding more water. The water offers the perfect level of support ranging from soft to firm. This pillow is made with a hundred percent cotton pillow cover that’s machine washable and features an extra-large size for improved comfort and total support. Pros: While there are a number of neck support pillows available, most are geared toward only a couple of particular sleep positions. The quality of your sleep can have a major impact on how you feel, and whether or not you’ll wake up with tension or pain in your neck and back. For improved sleep, you need to use a pillow that keeps both the spine and neck aligned and provides support to the head. This model features an inner water chamber that can be filled to the desired level for custom comfort. This will allow the user who sleeps on their side to use a pillow that offers the right height so their head remains level with their back. Back and stomach sleepers can choose to reduce pillow height so that the head isn’t pushed forward. Mediflow has been creating high-quality support pillows since the early 90s, utilizing the best in sleep technology to provide products that encourage peaceful, uninterrupted sleep. This pillow was tested at John Hopkins University and ranked well in five categories including neck pain reduction, overall sleep quality, the time it took the average person to fall back to sleep using this pillow and the amount of uninterrupted sleep each person experienced. Unlike other pillows that feel great at first only to end up losing their shape and support, this pillow works to retain its shape all night long and moves with the user’s body when they change sleep positions. The amount of support the pillow provides also takes the pressure off the neck and head, by distributing the user’s body weight as they move. Inside the pillow, the waterbased chamber is covered with a thick layer of polyester filling, which gives the pillow that cloud-like fluffiness for the head. The waterbase is what provides flexible movement, adjustable height, and proper neck support. The outer casing of the pillow is made from a high cotton threading count for a smooth, soft feel that remains comfortable and cool all night. This pillow offers plenty of surface space, allowing it to accommodate back, stomach, and side sleepers. This pillow is also recommended for pregnant women who need additional neck and back support. The pillow’s cover is removable, providing easy access to the water chamber in order to adjust the water level. You won’t need to use any chemicals to keep the water fresh thanks to the tight seal that allows the water to remain bacteria-free for up to one year. Since light is unable to penetrate the thick padding, you also won’t have to worry about algae growth. If the cover gets dirty, simply remove it and toss it in the washer and dryer. In addition to a good mattress, a pillow that provides the right amount of support will work to keep you comfortable while also ensuring the spine remains in the correct position at all times. This is the most effective way to prevent chronic pain caused by lack of support or improper sleep positions. Quick Tip: With a standard pillow, more problems are caused when a person changes positions during the night, but this model will allow the user to shift comfortably with ease while still providing necessary support to the spine and neck. Cons: Compared to the average polyester filled pillow, this waterbase model is much heavier, making the pillow somewhat cumbersome. But once you get used to the weight and feel it won’t be much of an issue. The Tempur-Contour Side-to-side Breeze pillow by Tempur-Pedic is a lightweight option that can also help to reduce neck pain and is also more travel-friendly. This is the perfect pillow for the restless sleeper or for people suffering from ongoing neck pain. Priced affordably, consumers who purchased this model gave it a rating of five out of five stars for overall quality.